I finished writing my comments to the FCC on net neutrality and Title II classification. In summary, I fully support maintaining the existing Title II classification and using that classification to enforce the existing net neutrality rules. Click through to read my full comments in all their gory detail. Three different bar graphs built using Matlab, Eagle, Fusion 360, and 3D printing. While building my zombie containment unit, I decided I wanted some LED displays or bar graphs to complement the containment status video running on the smaller secondary video monitor. Some other containment units used LED air pressure gauges from eBay. I wanted to achieve a similar look, but I also wanted my gauge to be software controllable so I could change the number of segments lit in response to events in the playback of the two videos. I decided it was time to build my own LED bar graphs. 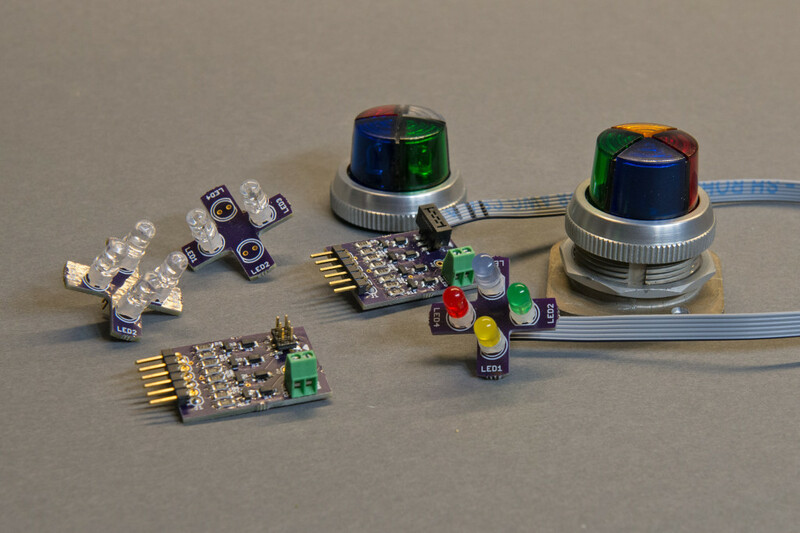 LED and driver boards used to turn bulky, current-hungry Allen Bradley incandescent cluster pilot lights into something more hacker friendly. I was recently working on a project and wanted to incorporate one of Allen Bradley’s four-position, four-color cluster pilot lights into the project. A quick search of eBay found several lights with the lens colors I wanted but not at the voltage I wanted. Furthermore, the lights were all incandescent and illuminating just a single segment would pull almost 200mA at 6V. That’s a bit more current and voltage than I could supply from a 3.3V microcontroller or FPGA pin. I went ahead and ordered a few complete lights that had the colored lenses I wanted and hoped I could find some way to replace the incandescent bulbs with current-sipping LEDs. 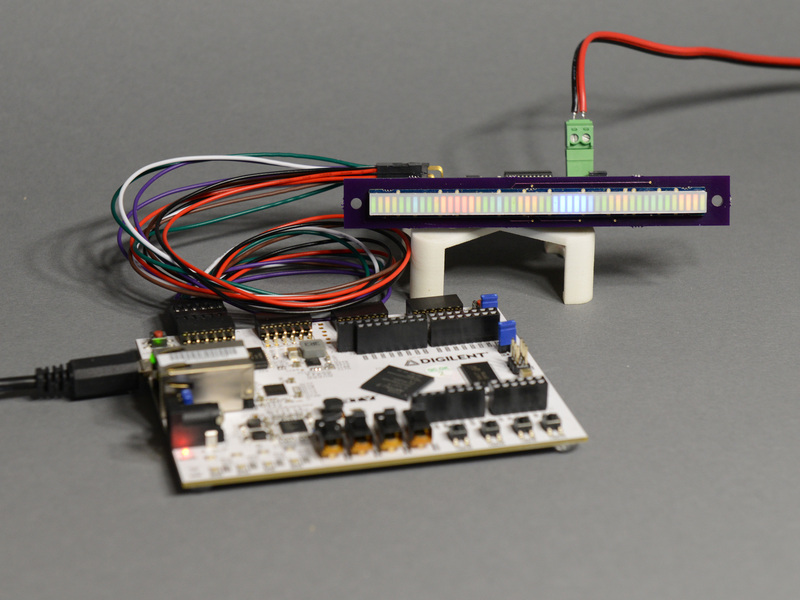 Controlling the RGB bar graph with a Digilent Arty board and my driver and carrier boards. The bar graph is a bit washed out from the lighting used to take the photo. I recently picked up a 48-segment RGB LED bar graph from SparkFun. The bar graph’s 144 LEDs are arranged in a common-anode matrix of 16 x 9 LEDs. I was hoping to drive the display with something like a Maxim MAX6954 LED display driver. Unfortunately, that display driver is common-cathode and only 16 x 8. A quick Google search found that most display drivers topped out at a 16 x 8 matrix of 128 LEDs—not enough for this application. I quickly came to the realization that I was going to have to build my own display driver. 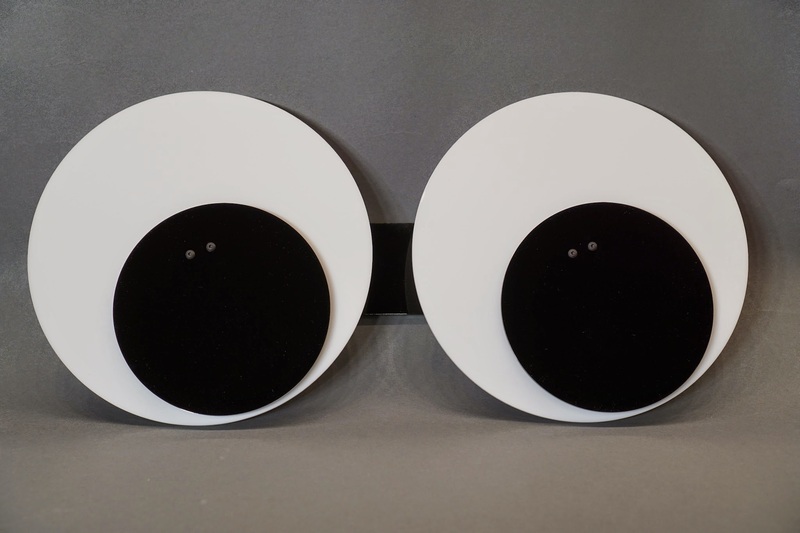 In part 1 of this series of posts, we built a giant set of robotic googly eyes. In part 2, we brought the googly eyes to life using an Arduino. In this post, we’ll use OpenCV to make the googly eyes detect and follow people as they move around the room. More specifically, we’ll use OpenCV to detect faces on a webcam and move the googly eyes to look roughly in the direction of the largest face in view. 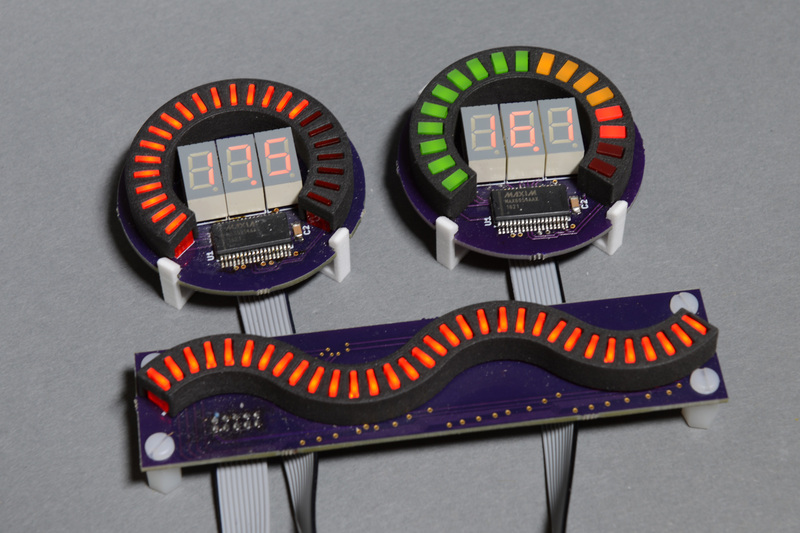 In this post, we’ll add motion to the googly eyes using a microcontroller and some stepper motor drivers. In part 1 of this series of posts, we built a giant set of robotic googly eyes. Now it’s time to animate them! To keep the project simple, we’ll use an Arduino Uno and a pair of Big Easy Driver stepper motor drivers. Let’s get started. Completed robotic googly eyes. The scleras (whites of the eyes) are about 8″ (200mm) in diameter with 5″ (125mm) pupils. Build your very own pair of giant robot googly eyes! These eyes are built from laser cut acrylic panels and motorized using a pair of NEMA-14 stepper motors. This post is the first in a series of three posts. In this post, we’ll build the googly eyes. In the 2nd post, we’ll look at hardware and software to animate the googly eyes. In the 3rd and final post, we’ll connect the eyes to OpenCV to make them track motion and faces in a room. 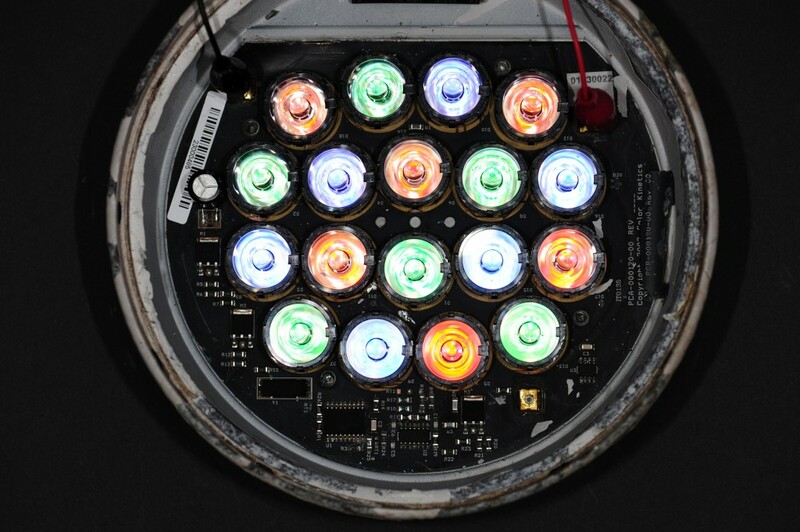 The internals of my formerly waterlogged Color Kinetics ColorBurst 6 RGB LED lighting fixture. I’ve had three Color Kinetics ColorBurst 6 RGB LED fixtures in my front yard for about ten years now. They’ve survived numerous winter snowstorms and spring monsoons. Recently one of the three fixtures started taking on water and the blue and green channels began flickering. Having served its useful life in the front yard, I promptly removed it and replaced it with a new fixture. This left me with a water logged fixture that almost but not quite worked. Time to drain the water and do a proper teardown. Read on to see how a commercial-grade RGB LED light fixture works. The image above shows two enclosures for a printed circuit board design. These were designed using the inexpensive hobbyist version of CadSoft Eagle and the free maker version of Trimble SketchUp. The free version NetFabb Basic was used to check the design for manufacturing. The enclosures were finally 3D printed at shapeways.com using their EOS Formiga P110 SLS 3D printers. 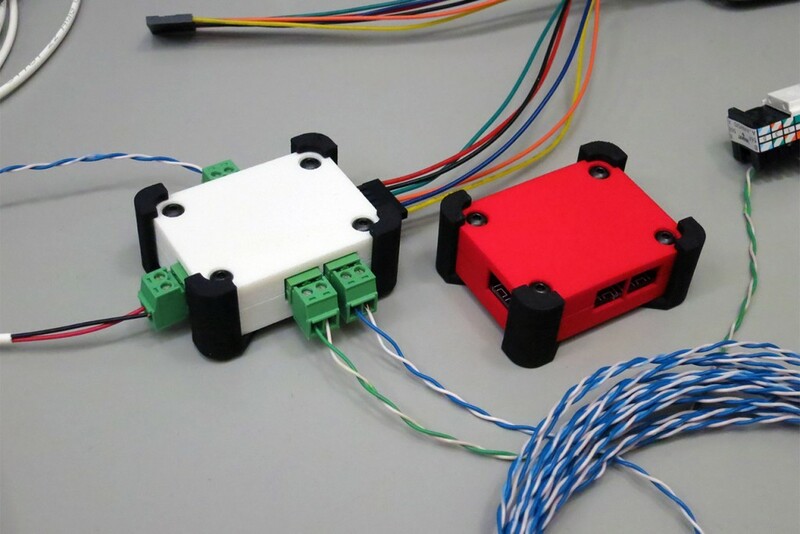 Read on to see some of the lessons I learned while designing and printing these enclosures. After seeing this cube and this cube, I decided it was time to build an LED cube of my own leveraging the BeagleBone Black and FPGA work I had already done for my six-panel mini video wall. The cube project is essentially purely mechanical since the existing BBB software and FPGA code will work unmodified to drive the cube. 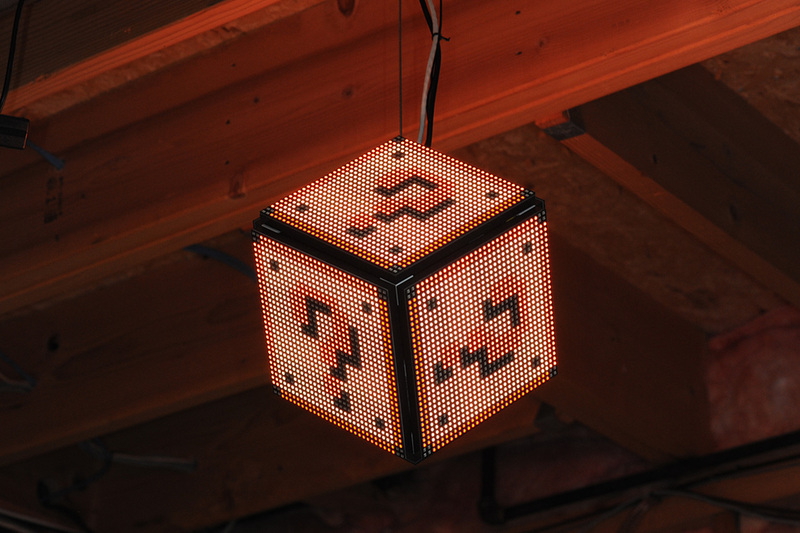 The finished cube hanging from the rafters in my basement.